The GRIFEX operations team just wanted to give you a quick update on operations and thank you for your continued support of the mission. First off, we’ve now had 30 successful MARINA run completions at various locations across the US and Canada. Many of these images have unfortunately been saturated, but we did downlink a few images with interesting features. We are still waiting on confirmation from JPL of a good image before we release these images, but it appears as though the most interesting ones come from mid-latitudes in the continental US (Arizona or Virginia latitudes). In addition to MARINA data, we’ve also been downlinking telemetry to ensure the continued health of the satellite, as per usual. 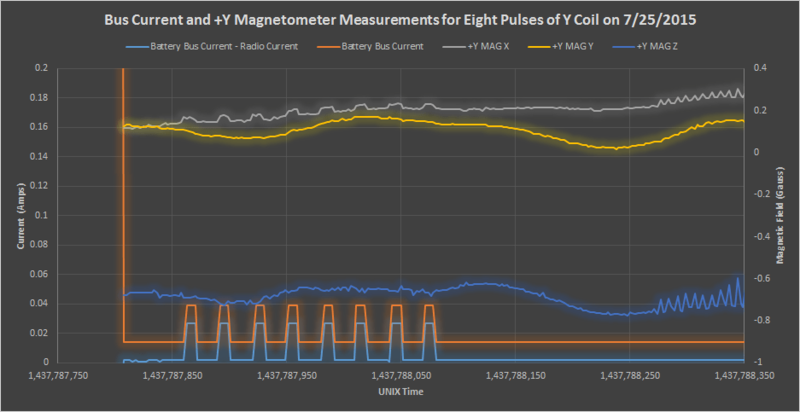 You’ll note that the X and Y coils draw much less current than the Z coil does and generate a much weaker change in magnetic field – this is because the Z coil needs to be strong enough to overcome the permanent magnet on GRIFEX (which is aligned with the Z axis of the spacecraft) if necessary. 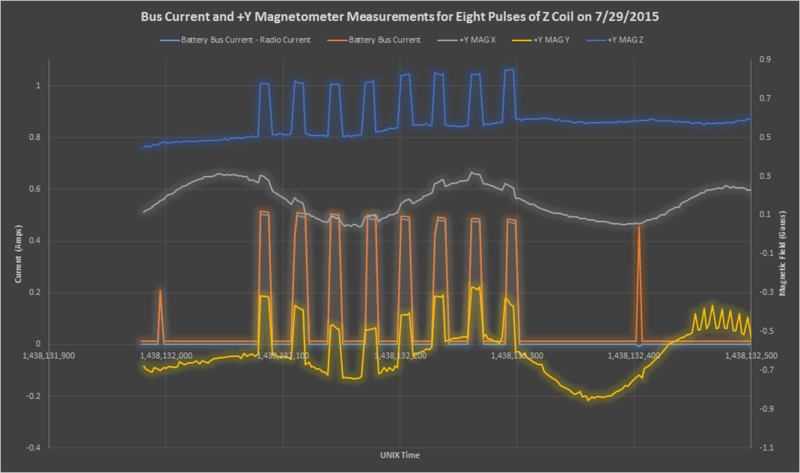 Thus far, we have only experimented with running current in one direction through the magnetorquer coils, but we plan on completing “pulse” tests with current running the opposite direction before we attempt full attitude control of the spacecraft. Another event to note is that GRIFEX stopped beaconing sometime between 7/30/2015 23:45:00 UTC and 7/31/2015 00:51:00 UTC. At the 00:51:00 UTC pass over Ann Arbor, we attempted to reset the spacecraft, but to no avail; GRIFEX was neither beaconing nor responding to any commands we sent. GRIFEX remained silent throughout 7/31/2015, but luckily a watchdog timeout reset the spacecraft and we started picking up beacons again on 8/1/2015 13:55:00 UTC. We are still unsure of what caused this anomalous behavior, but we have been downlinking telemetry from the time period during which GRIFEX was silent (beacons were still being created and saved on the spacecraft) to debug the problem and ensure it does not happen again. A big shout out to the hams that were tracking GRIFEX during this worrisome time and alerting us to the fact that it was silent! We are all very glad that the GRIFEX mission can continue now that the spacecraft is beaconing again. This entry was posted in Grifex and tagged Update by PE0SAT. Bookmark the permalink.